With or without the benefit of ground penetrating radar, your workers need to be as precise as possible when they are sawing through concrete and when they need to drill through it as well. Working with concrete can be dangerous. That’s why precision is so important. If your workers make the wrong cuts or drill at the wrong angle, it could cause a blockage or damage to the tools that can slow down the pace of the work. It’s also possible that a wayward spark could ignite a hidden gas line that is leaking. With or without the benefit of ground penetrating radar, your workers need to be as precise as possible when they are sawing through concrete and when they need to drill through it as well. Let’s find out why. First and foremost, all concrete workers need to be safe on the job site. It doesn’t matter what type of concrete they are working with or what they need to do with it; safety measures ensure they can get it done as quickly and efficiently as possible. The training they receive not only allows them to know what they need to do to operate their tools correctly but also how to react when a disaster happens. New workers on your crew might still be learning on the job. However, this isn’t always the most advisable situation; workers who lack experience are more prone to making mistakes or causing accidents, often through no fault of their own. OSHA certifications and guidelines are in place for a reason. The fewer workplace accidents you have, the more jobs you can complete and build your reputation, allowing your company to succeed and grow. Following all training recommendations will only help with that endeavor. Drilling through concrete is complicated enough under normal circumstances. Now imagine trying to do it in foul weather. That only adds to the degree of difficulty involved. Drilling half an inch deep is a much different challenge than drilling two feet down. Drilling through concrete slabs and walls is an essential task, especially when you need to add plumbing, HVAC, or telecommunications line to a building. Two other types of concrete work are sawing and cutting. Wall sawing can open new spaces in the wall that the original building design didn’t anticipate. Slab sawing is another necessary part of the job because you never know when you will find a slab or how to deal with it correctly. Sometimes, a partial cutting job into it is more effective than cutting through it. Lastly, it is occasionally necessary to create rumble strips to slow down cars that are speeding through the site and slice through concrete enough to shave it down and move it somewhere else. Concrete grinding and grooving are just as necessary as drilling and cutting, so your workers need to know how to complete all of these tasks. 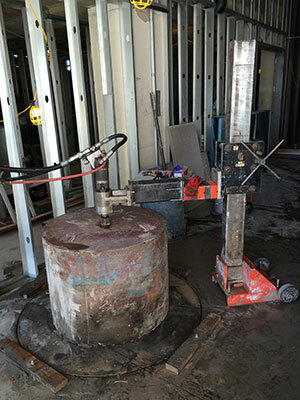 G&M Services offers services in the way of concrete drilling and sawing, concrete scanning, and FireStop. To get started with us, call today at 410-787-8828 or visit our contact page. Follow the official company page today on Facebook, Twitter, and LinkedIn. This entry was posted on Friday, April 5th, 2019	at 2:27 pm	. Both comments and pings are currently closed.